Bearington Twirlina Ballerina Plush Stuffed Animal Bunny 12"
Bearington Collection Bears Bunny Rabbit Purple Ribbin Jointed Rabbit Tall 12"
New ListingBearington Bear Collection "Neil"
Ending 2 May at 16:32 EDT9d 10hTop Rated SellerBrand: BearingtonSize: 12in. Top Rated SellerBrand: BearingtonSize: 14in. Vintage Bearington Collection Stuffed Duckling Quackers Yellow Chick Plush 5"
Ending Friday at 11:42 EDT3d 5hBrand: BearingtonSize: 13in. 2006 THE BEARINGTON COLLECTION ..BALLERINA TEDDY BEAR 16"
We also have the wood Bearington Stands both large and small, which has the Bearington logo on the wood base. Better yet as a gift! Don't delay, it may get away! Be sure to check back for more Bearington! In good condition. Super cute! The Bearington Collection Easter Rabbit with duck in basket Tulip and Ducky 19"
She's very cute in good condition. Top Rated SellerFrom United StatesBrand: BearingtonSize: 19in. The Bearington Collection. She has matching big pink & green bows on her ears and an adorable white bunny tote/purse in her paw. She’s soft, fuzzy and feminine though and through! A perfect Easter gift for that special little or big girl! The Bearington Collection Bear Christmas Gift Red Dress Hat Flower Holiday 14"
1995 Artisan Flair .Mini Doll Collection.Figurine. Bearington Bears. S ad ie i s an adorable little 10” be ar d re ss ed i n apink, seersuckersundress. Sh e ha s a pi nk polka dotted bo w wi th curly pi nk & l im e ribbon on h er head.S he ’s deliciously sw ee t, j us t li ke h er i ce c re am ! Limited edition Bearington collector bear “Greg” with Canadian hoodie Spring 2003 Retired 2004. Style number 1413. Baby Blush is a beautiful 12 1/2" pale pink plush bear with extra soft fur. She is fully jointed and poseable. Even her head turns! Baby Blush has pale pink velvet paw pads, deep brown eyes and soft, luxurious fur you have to feel to believe! From United StatesBrand: BearingtonSize: 12in. Very cute bear ornament for Christmas. New with tag see all pictures for details. 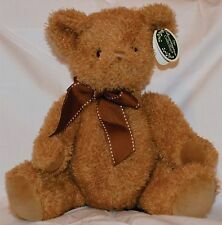 BEARINGTON BEARS "WENDY WINESAP" w/tags. HTF~RETIRED~WOW! WENDY IS WEARING A DEEP GREEN CORDUROY DRESS WITH MACINTOSH APPLES ON HER COLLAR. SHE WEARS PLAID RIBBON BOWS ON HER HEAD TO MATCH HER DRESS TRIM AND CARRIES A MACINTOSH APPLE IN HER HAND FROM THE ORCHARD.TOO SWEET. SUPER CUTE BEARINGTON BEARS HOLLY HARVESTING 14"COLLECTOR BEAR W/STAND! SHE IS WEARING AN ORANGE CORDUROY JUMPER WITH TWO PUMPKINS EMBROIDERED ON THE COLLAR. HOLLY IS HOLDING A PUMPKIN IN HER RIGHT PAW IN LIKE NEW CONDITION FROM A SMOKE FREE HOME. Pair of jointed, stuffed brown bears in red and white polka dot dresses. Jackie # 1539 - she is 14" tall. BEARINGTON BEARSSOCKO. We have been a Bearington Dealer for over 10 years and are closing out this product line, so this is the LAST ONE. We are certified teddy bear dealers. We have for your consideration “Sara” from the Bearington Bears Collection, #1064. Sara and her teddy bear have head, arms and legs that are jointed. Bearington Collection, Sara #1064. Papa Santa Beary stands 14" in height. He has a white trim at the bottom of his Santa top and white trim down the middle of his top as well. On the top of the white down the middle, he has two black buttons and he also has a black buckle. The Bearington Bear Ladybug Dress Red and Black with Bear Display Stand 10"
Bearington Collection Tulip and Ducky. Designer rabbit dressed in a pale yellow dress with a purple ribbon and a yellow hat. She is carrying a basket with her ducky in it. I will respond as quickly as possible. Nice lightly used Morty m ummy Barrington bear collectible. Number 181317. She is adorable and perfect for Spring! 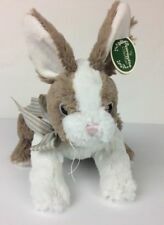 Anita Quaker is a beautiful 14" light tan plush rabbit. She is in a sitting pose and is adorable. Anita Quaker has pale pink velvet paw pads with pink detailing and soft brown eyes. THEY ARE DRESSED IN SPRING EASTER DRESS OUTFITS IN A PALE PINK AND ROSE VINE FLORAL PRINT. A WONDERFUL PAIR AND HAT BOX FOR EASTER AND SPRING. Bearington Christmas "Rosetta Poinsettia" Musical Teddy Bear Plush W/stand very good vintage condition Shipped with USPS Priority Mail. Bearington Collection Teddy Bear 13" Plush Stuffed Animal heart pendant & dress!